We’ll take 20% off the price of any screened room order placed during the month of May. Don’t miss out! Screened Rooms by GAZEBO-penguin feature extra heavy duty aluminum with baked enamel finish and 100% rust proof fibreglass screens. For gracious warm weather entertaining for your family and friends. Moves your living room outdoors where it’s cool. Use it in the garden, as a cabana, a card room or around a spa. Makes a great sitting room (cool by day, too, thanks to ultraviolet shielding in the roof). Makes a great bedroom on muggy nights. 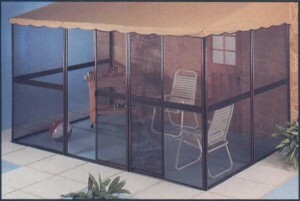 Optional wind or privacy panels, clear or white, provide extra privacy or protection from wind. Safer for children as they can open the door without having it spring back on them. The door handle can be put at any height so that the children can reach it. Comes with a tracking system to fasten to a wood or concrete platform. Roofs have an ultra violet light inhibiter. 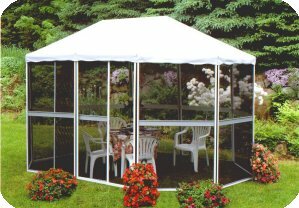 Wind panels come in a sets of clear or white and are easily installed or removed. Round rooms come in 10′, 11′, 12′, 13′, and 14′ diameters. Square rooms are 7’6″x7’6″, or 11’4″x11’4″. Rectangular rooms are 7’6″x9’6″, 7’6″x11’4″, and 11’4″x15’1″. 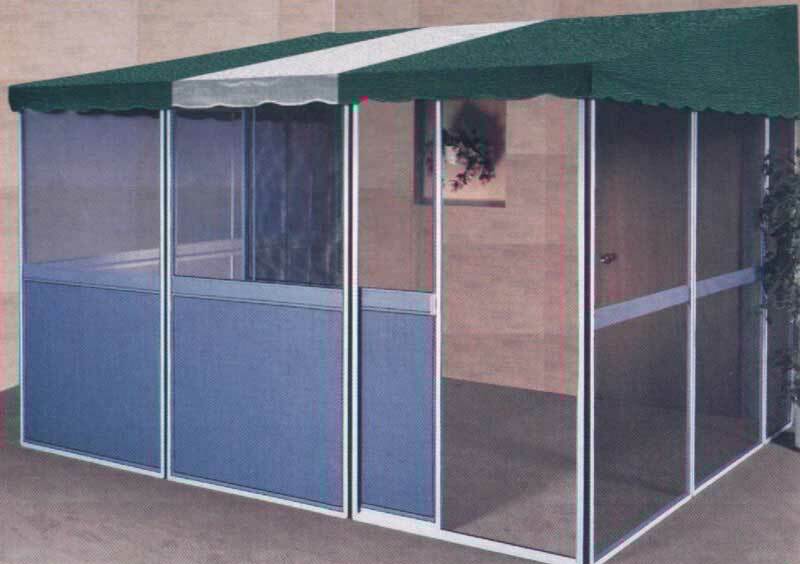 Homeowners and Campers can extend the enjoyment of their Patio, Lawn or Deck with Add-A-Room’s easy to assemble screen enclosure which attaches to any exterior wall or Trailer or RV. Because of the larger rafters these rooms can be obtained in a variety of lengths from the trailer wall outward. The standard sizes are 7’6″, 9’6″, and 11’4″. The available widths of the room (along the trailer or house wall), are 7’6″, 11’4″, 15’1″, 18’10”, 22’7″ and 26’3″. These can be manufactured to custom sizes as well, for a premium surcharge, but these are regular production sizes. Families can now enjoy outdoor living such as barbecues, parties, sleepouts, or hot tubs without the annoyance of insects. Add-A-Rooms give you the chance to enjoy outdoor living. Add-A-Rooms are simple enough for two people to assemble. Details and diagrams for step-by-step instructions are provided in every box. Optional wind panels come in a sets of clear or white and are easily installed or removed. 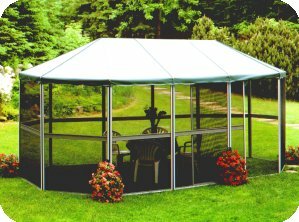 providing greater privacy and wind protection. Add-A-Rooms are available in a variety of sizes to fit most patios, decks, RVs and trailers. The regular Add-A-Room features the same construction principles, but with the lighter roof rafter construction to reduce cost, using tubular aluminum rather than the 1 3/4″ square tubing used on the deluxe model. This is a slightly less expensive room than the Deluxe model, but every bit an equal room in all other respects. The lengths are 11’4″, 15’1″, 18’10”, 22’7″, and 26’3″. Custom length sizes are available, for a premium surcharge. We also carry in-stock, or can get in a very short time any required parts for these rooms. Call (705)-887-7113 for prices OR use our contact form. NOTE: Please include style and size in any inquiry for pricing.